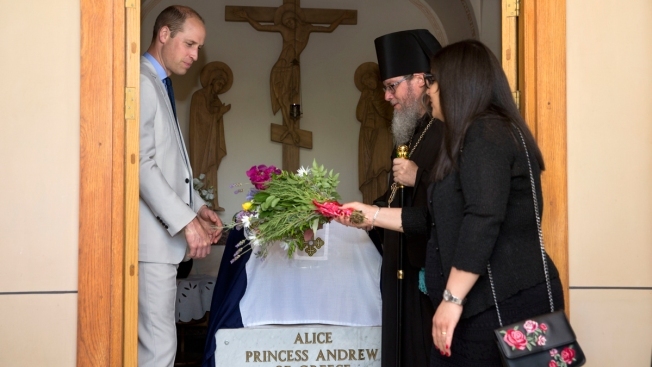 Britain's Prince William, left, visits the grave of his great-grandmother Princess Alice of Battenberg during a visit to the Mary Magdalene Church, in east Jerusalem Thursday, June 28, 2018. The Duke of Cambridge's Jerusalem leg is by far the most charged of his five-day tour of Jordan, Israel and the Palestinian territories — the first official visit of a member of the British royal family — as he ventures into the heart of world religion and regional politics. The trip has been carefully orchestrated as a non-political event, and the prince has been watchful in his words and actions not to stoke controversy as he met with Israeli and Palestinian leaders and toured the region's various locales. But the Jerusalem sites he visited are central to the century-old conflict and every step he took was closely scrutinized. The prince stood solemnly by his great-grandmother's grave, accompanied by a Russian Orthodox clergyman. He was then given several gifts by the clergy, including a bouquet of flowers and a cross. With the homage, William followed in the footsteps of his father Charles, the Prince of Wales, and grandfather Philip, the Duke of Edinburgh, who had also visited Princess Alice's grave. At the Western Wall, he was accompanied by the site's rabbi and security guards as he approached the wall. Donning a black skullcap, he placed his right hand on the ancient stones and then, following tradition, slipped a note inside its cracks. He signed the guestbook with the following passage: "May the God of peace bless this region and all the world with peace". "Today we experienced a moment of history which will live long in the memory of Jews around the world," said the Chief Rabbi of Britain Ephraim Mirvis, who accompanied the prince in his visit. "The Western Wall stands at the epicenter of our faith. To see the future monarch come to pay his respects was a remarkable gesture of friendship and a sign of the duke's regard for the sanctity of Jerusalem." Israeli politicians were angered that the royal itinerary mentioned the Old City of Jerusalem as being part of "the Occupied Palestinian Territories," rather than part of Israel's capital. Jerusalem Affairs Minister Zeev Elkin — who is running for mayor of the city in this year's elections — called the reference a "distortion" that cannot "change reality." His fellow hard-line Cabinet minister from the ruling Likud Party, Miri Regev, said it was "impolite" of the prince not to meet Jerusalem's mayor in the city.